When you research celiac disease treatments, you'll find one answer: a cross-contamination free, gluten-free diet. And, although clinical trials are presently testing other treatments for celiac disease, a magic pill isn't hitting the market anytime soon. But what happens if you're diagnosed with celiac disease and go gluten free like your doctor orders...except this celiac treatment doesn't seem to work? It's a scary question, but one that I know all too well. Why? Because I have celiac disease - and I needed more than just a gluten free diet to heal from my celiac complications. Here's my story of what happens when a gluten-free diet doesn't work...and my message to every celiac still struggling on the typical "celiac disease diet." On average, it takes six to ten years for someone to receive a proper celiac diagnosis. Thanks to a dedicated doctor, I got "the call" only a few months after my symptoms (acid reflux, stomach issues and random weight loss) started popping up. When my doctor first said "celiac disease," I had no idea what she was talking about. I didn't even know "gluten" was a real word! Yet, even as another chronic illness was added to my medical chart, I couldn't help but smile. I wasn't crazy! There really was something wrong with me! And it could be fixed! Around one week later, I underwent my first endoscopy. The walls of my intestines looked as smooth as the medical bracelet around my wrist, gluten having destroyed all of my villi. 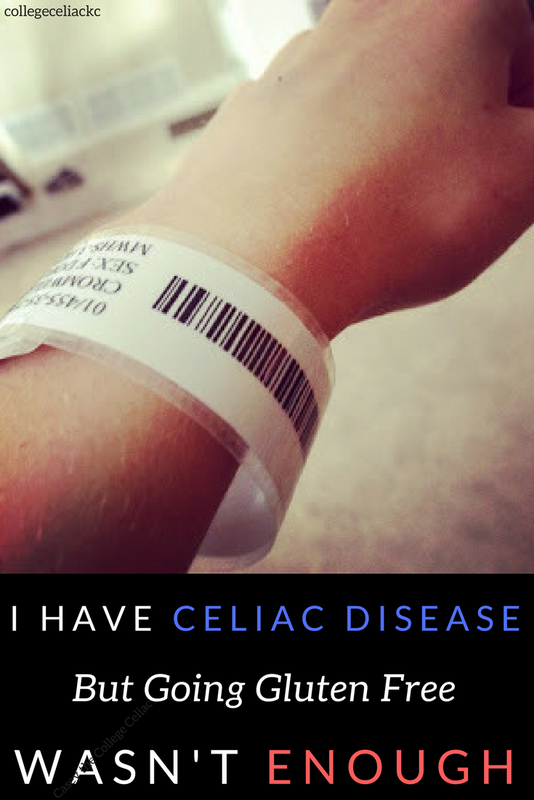 It was official: I had celiac disease. One meeting with a nutritionist later, I was sent out with a "gluten-free gift basket" in one hand and a list of "gluten-free" and "not gluten-free" foods in the other. I set up a follow-up appointment with my gastroenterologist for one month later, but no one expected any issues. Adjusting to a gluten-free diet (the year of my senior prom, no less) would be challenging. But if it would make me feel better, I was 100% ready to kick gluten to the curb. Little did I know that recovering from the damage celiac disease had already caused wouldn't be nearly that simple. I was diagnosed in May of 2013. By August, I was still losing weight. It wasn't that I didn't want to eat; I didn't feel like I could. My stomach still rebelled against most foods, even when they were certified (or naturally) gluten-free. I tried eating paleo. I tried eating healthy gluten-free foods, and I tried just shoveling in the calories. None of it was working. Two days before I moved into my college freshman dorm at Point Loma Nazarene University, I spent the morning in the hospital for my second endoscopy and first colonoscopy. Three weeks into my first college semester, I was "that girl." The girl who was losing the Freshman 15 that everyone else was gaining. The girl who panted so loudly after walking across campus that soccer practice seemed like a made-up memory. So, when my email filled with messages from my doctor only a few days before my 18th birthday, it wasn't a surprise. My colonoscopy images were in. Healed villi. Good. Continual inflammation in the stomach. Bad. A liquid diet for three months on the doctor's orders. If I failed that? Two choices: a nose drip, or a hospital stay. Not mutually exclusive. I enjoyed a birthday dinner at Chick Fil A and then filled my mini fridge with the protein drinks my doctor prescribed. I lasted two days on the first variety. You start to wonder just how good a gluten-free protein shake can be for you when it permanently stains the inside of your metal thermos...not to mention keeps you constantly nauseous and in extreme stomach pain. The second brand was better: allergy-friendly juice packs and protein mixes meant for kids 14 and younger. But I still felt alone, not only among "normal" college students but also in the celiac community. I'd never heard of any others with celiac disease going on a liquid diet. However, recent research has proven that I'm not the only one who experienced continual inflammation on a gluten-free diet. The University of Chicago found that intestinal healing can take up to two years, particularly in those diagnosed later in life. Meanwhile, a 2009 study concluded that it is "exceptionally rare" for celiac adults to exhibit "normal" intestines, even after following a strict gluten-free diet for 16 months. Adolescents with celiac like myself aren't immune to these issues, either. One 2008 analysis of 45 children treated for celiac disease discovered an increased presence of T cells, one sign of inflammation. What am I trying to say? Not that those with celiac disease shouldn't go on a gluten-free diet or that celiacs can't benefit from a gluten-free diet. Following a gluten-free diet is still the main celiac disease treatment, and that shouldn't change. However, not everyone heals at the same pace or by only using a gluten free diet. And, for some celiacs like me, healing may not happen until doctors take extra steps to help...or until you hit rock bottom. I was the oldest patient admitted to the children's ward in the gastroenterologist wing of my hospital. I'd just turned 18 a few weeks before, but when I stepped on the scale - clothes on, breakfast eaten - I weighed 83 pounds at 5'3". The liquid diet didn't work. Now, it was time for the last resort. I don't remember all the details of my hospitalization, likely because of the malnutrition and vitamin deficiencies discovered by my doctor. But I remember tearing up as a feeding tube was forced up my nose and down my throat. I remember the night a neonatal nurse had to be called to replace the IV in my hand. And I remember the morning rounds when doctors and trainees would gather around my bed. They said words like "celiac disease," "failure to thrive," and "uncertain causes." My doctors used a similar vocabulary. They didn't know why I wasn't healing on a gluten-free diet like normal. They didn't know when I could return to college, which I stubbornly refused to drop out of for the semester. I stayed in the hospital for four days. In fact, I wrote the final research paper for my politics class in that hospital bed. And then I went home, feeding tube intact. At the time, my doctors wanted the feeding tube to remain indefinitely. Yet - like I shared in one of the most popular blog posts today - I hated the thought of returning to school not only as the skinny hospitalized chick, but also as the girl with the nose tube and feeding-machine backpack. So I didn't. The day before I went back to class, I pulled out the tube and watched as it disappeared into my bathroom trash. My doctors were giving me one shot. Could I eat - or, more precisely, could I heal - on my own? It was time to find out. Honestly, I don't know what flipped the switch for my body. But, after being hospitalized and fed who-knows-how-many nutrients each day through the feeding tube, I slowly started healing. (And by slowly...I mean months and months). I could eat (gluten-free, of course) without stomach pain. I was still thin, but I no longer looked like a skeleton. My hallmates decorated my dorm door with a "Welcome Back" sign, and, in a way, I felt like I was welcoming back the old Casey. Besides my hospitalization, though, I took several other steps to help give my body the boost it seemed to need. I cut out dairy when I noticed how much it bothered my stomach. I eventually discovered the low fodmap diet and pinpointed several foods - like garlic, onion and mango - that turn my tummy into a time bomb. (And I slowly reintroduced other high fodmap foods, like avocado and beans, that I could and still do enjoy today). I also began exploring yoga, stretching my ability to relax and meditate as I stretched my body. Basically? I tried to listen to my body extra closely. I avoided (even the gluten-free) foods my stomach didn't seem to tolerate at the time. I also ate to my appetite, even when my hunger was insatiable. (For over a year after my diagnosis, I remained at 88 pounds, no matter how much food I packed in. Looking back, I'm guessing all my calories were being spent on healing). Slowly, I learned to trust what my body was telling me...and, slowly, it started doing what it was supposed to do in the first place: thrive on a gluten-free diet. I have celiac disease; today, however, my celiac disease is officially in remission. I am thin and lose too much weight when stressed, but I am healthy. And I am so grateful for the doctors who were willing to take the extra steps that my body needed to heal. Love this post? Show me by tweeting! 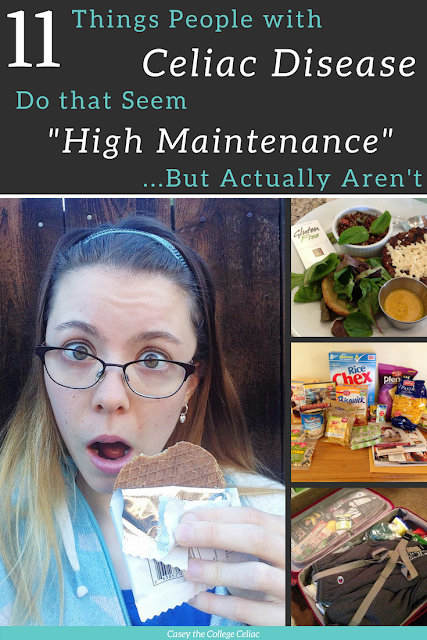 Just click here: "Why a #glutenfree diet wasn't enough to heal this #celiac. #hospitalization #liquiddiet #health via @collegeceliackc http://bit.ly/2qQ3MCB"
I'm not a doctor. I don't have the answer to why some people diagnosed with celiac disease heal immediately on a gluten-free diet while others, like me, struggle. I do know, this, however: if you have celiac disease and a gluten-free diet doesn't seem to be 100% working, you aren't alone. You aren't the only one who needs to avoid more than just gluten in order to feel better. You're not the only one who is taking (or took) a year or more to feel "normal" after a celiac diagnosis. And you're not the only one still searching for that right mix of treatments - whether it's the right diet, the right doctor or just the right amount of time - to help you feel your best with celiac disease. After I was hospitalized, I made forever friends. I fell in love for the first time and later survived my first heartbreak. I graduated college with a 4.0, and was accepted by a fully-funded grad school program. I am doing better than I ever thought I would be as I felt that feeding tube scratch the back of my throat. My main hope? Someday, you'll be able to share a similar story: the story of how celiac disease might have kicked your booty a time or two, but you won. And, now, you're rockin' life while gluten free. What is your celiac disease story? Did you find that going gluten free wasn't enough? Tell me in the comments below! Wow, Casey. This is a touching story. I'm so glad you shared your experience. I have two people in my family that suffer from this, but I had no idea how bad it could get. You seem stronger now (in many different ways). Good luck on your journey to a healthy and happy life! Thanks for the kind words Alicia. Sending much love to you and your family! Thank you for educating me on Celiacs Disease! My best friend in college had it (however a more mild form it seems) and I only knew the basics of the disease, to me she seemed so healthy. It kind of reminds me of my own PCOS, the fact that someone can seem healthy from the outside, but be fighting to heal on the inside. Thanks for sharing your experience, Monica. It's definitely amazing how some people with celiac disease heal easier than others! Sending lots of love your way! This is seriously on-time. I left the hospital on Friday afternoon after having serious chest pains, nausea, indigestion, joint pains and inflammation. Tests ruled out an heart attack, but I am to do further tests. However, from past experience I think it is a bad case of gluten intolerance. It has been 2 days since I decided to omit gluten products from my diet and am slowly gaining strength. Thanks to your post, I have learned that I should be patient as it may not go away as quickly as I would like. I now see how dangerous it is and that I should stay away from gluten for the rest of my life. I am happy that you are thriving. Thanks for this very informative post. Please please get a biopsy test done before going gluten free. The test won't work unless you have gluten in your system. Going back onto gluten after being gluten free will feel bloody awful!! Seriously. Get tested while you have gluten still in your body. Reactions are far worse after you've eliminated it from your diet. Good luck. Hi Brian. I definitely agree with Teale. PLEASE make an appointment with your doctor to be tested for celiac disease. The initial test is a simple blood test, followed by an endoscopy. Neither test will be as accurate if you go gluten free first. While you may end up following a gluten free diet either way, knowing whether you have celiac disease or gluten intolerance can be important, not only for legal accommodations but also for knowing how strict you need to be with your diet and cross-contamination. Since celiac disease can cause many other health complications, it's also important to know if you have it so your doctor can monitor your health for other complications. Best wishes! Hi Casey. I enjoy reading your blog. Thank you for sharing your story. I am so glad that you are doing so much better. My celiac disease story is very different from yours. It started the day after Thanksgiving in 2014. I knew there was something wrong. To make a long story short, I ended up at the hospital and they finally diagnosed me with pancreatitis. The normal lipase enzyme level is between 80 and 180, mine was 10,000. I had to go on a low-fat diet. 6 months later I had another bout with pancreatitis. My lipase level this time was 26,000. And I had started to lose weight. My 3rd bout occurred 9 months after the 2nd. Lipase level went up to 34,000 this time. Pancreatitis it is a deadly disease. I went to see a Specialist. After doing some blood tests, scopes, etc. it was discovered that I had Celiac Disease. I have found out that people who have celiac disease can have a variety of symptoms. The Specialists believed that my pancreatitis was a symptom of the disease. (Other than losing some weight, and stomach aches). So I was put on a gluten free and low fat diet. And I've not had a bout of pancreatitis for 16 months now! No pancreatitis, but I still have Celiac Disease. You mentioned something about people not understanding. I still have people to this day who, when I say that I can't eat "this" or "that" because it contains gluten, say "oh, you can eat a little bit, it won't hurt you" or "you haven't had pancreatitis, you can eat gluten again." They just don't understand. Thank you again for your blog and for opening up people's eyes to this disease. Huge, huge hugs. My 10 year old has celiac and I wouldn't wish it on the worst of my enemies. Your article is the first I've read of someone being on a liquid diet. My son hasn't been hospitalized bit he is constantly battling recurrent stomach pain and other issues from his celiac. We put him on a liquid/soft foods diet for a month just in an attempt to reset/relax things during one of his rougher periods and it worked wonders. Ours wasn't approved by the doctor or even suggested and actually, we had on ER doc pretty much tell us we were crazy for even doing it (even though it's a recommended diet for constipation issues, which he has) and got mad at us for not just using Miralax like everyone else, despite me telling him it causes reactions similar to gluten in my son. Anyway, your story makes me happy that you were able to sort it out and are feeling better! I'm going to show this to my little guy in hopes it makes him feel less alone. Thank you SO MUCH for sharing your story. I hope that my story can help your son feel less alone, as that's one of my main goals with this article. It's hard having a chronic illness, and even harder (in some ways) when you're diagnosed young. I hope that he is thriving soon and know that I am sending lots of gluten free love your and his way! <3 <3 <3 Please don't hesitate to reach out to me if there's anyway I can help. What an amazing story of resilience! You are so strong. I was hospitalized when I was almost 20. It was my sophomore year of college. While I have schizoaffective disorder, a psychiatric illness, I can relate A LOT to what your journey. I am officially in recovery, as well (remission, in your case). It is up to us to speak out so others know they are not alone. You are doing an awesome job! I am so glad to hear that you are in recovery. Regardless of what illness we have, it's never easy - especially when diagnosed young, like we were. Sending lots of love your way! Hello! I was diagnosed with celiacs about a year ago myself and it has been the struggle of a life time. I fortunately was just graduating college so I was able to start my journey at home although I don't know that it has been any easier. I have loved reading your blog and the struggles you have posted about have hit home for me on more than one occasion so thank you turkey for helping me put my emotions into actual words. I am curious about the liquid diet you mentioned and what you were using. I have looked for gluten free meal replacements and haven't been able to find one I could tolerate or that was truly GF my doctor has been little help and the RD he sent me to didn't even know what celiacs disease is. I understand a liquid diet without a doctor isn't safe but I think having the supplement for when I get glutened would help me a ton! Hi there! Unfortunately, I don't remember the brand of either that I tried (it was a bit of a blur during that time). However, I did use Ensure for a short time when I needed to gain weight and wasn't able to do so on a traditional gluten free diet, and it did relatively well. I would also encourage making your own "meal replacers" by blending things like frozen fruit (banana is especially easy to digest in my experience), chia seeds (for fiber and other benefits), cinnamon, turmeric (great for antioxidants), spinach, etc. Experiment with what foods make you feel your best. I've also found that activated charcoal pills can help me when I'm glutened. I hope this helps some! <3 Sending lots of love your way! Please feel free to reach out if you have any more questions or if I can help any other way. Wow! You've been through so much! I'm glad that it has all worked out better now and that you finally have a diet you can eat! Thank you for being brave enough to share your story! I'm sure this will help so many people out there who are struggling with the same issues. Thank you for the kind words, Lisa. Helping others is my main goal! Thanks for your kind words! Have an awesome rest of your week! Thank you for sharing your experience. I know that it will help encourage many others. Congrats, you're featured this week at the This Is How We Roll Link Party. What an inspirational young lady, it's great to read that despite your battle you are now on the mind. My Son now 13, was diagnosed 4 yrs ago, his intestine exactly the same, no villie present. I've actually booked to see a private doctor next week due to him remaining at the weight of 41kg in the last 12 months however growing to a staggering 5 foot 7. He looks so skinny - every bone in his spine, pelvis and collar is visible, it's like he is not thriving ! His body also takes ages to heal (cuts etc) - his last blood test also indicated that he was severely anemic something needs to be done ! I'm hoping we get some answers. Thank you for sharing. I was told today that I have to go on a full fledged gluten free diet. I can't stand it at all!! They also told me that it could very well give me cancer in my GI system. Today has not been a good day for me and I'm at the point I just don't want to eat. Your story has helped in making me feel that I'm not alone and that there is someone out there who does understand. Hi Casey -- I have an amazingly similar story from my diagnosis at age 15 in the 1980s. I still struggle with gut health at age 50 and have been diagnosed with 2 more AI diseases since my celiac diagnosis but I've found some great support in the alternative therapy world. Nothing seems to cure me, but I can get through flare ups much faster now. I now have a food company called ZEGO that makes superfood snacks for people with multiple dietary restrictions! Wow, I would love to try! I'm officially refractory celiac type 1. On budesonide (since May) and have lost 20 pounds. I'm hanging on to 111 pounds, but they keep coming off even though i'm eating everything possible. I'm also a type 1 diabetic with hypothyroidism. I just started azothioprine (an oral chemotherapy) to help get me into remission. Your story, and the way you wrote it, is such a help for others trying to understand what I am going through. Thank you for your story. It motivates me that someday, I too will be in remission. Wow, I'm only a few months into diagnosis of NCGS. I had the insatiable hunger you talked about too. I'm still not fully "well" but gluten was certainly the key. I'm going to test for IgE allergies also. Who knows I may have become sensitized to more things. I offered to do gluten challenge, but gastro said no. I have other gut issues, and have had them for all my life. Thanks so much for sharing your story. It's amazing, I was already using a mostly liquid diet for the same reasons. I still do skip a few meals and drink a protein shake instead of eating. My body isn't stable enough for three meals a day yet. Thanks so much for letting me and everyone know we're not alone. The narrative of "gluten free diet and no more problems" is not quite true for everyone. Thank you so much. I will use this information for my students to update them and i'm sure they will understand what makes our life meaningful. These are some really beautiful dishes! I'm a savory tooth kinda' gal so I would be happy with any of these egg dishes!